The story below comes via Constance Kellough (publisher) and Lorna Davis from Namaste Publishing in Vancouver. The Story of Armando originated in New York’s Central Park when Lorna Davis met a homeless man named Armando. His life story greatly impacted her and she subsequently approached Constance with the idea of bringing his story forward. 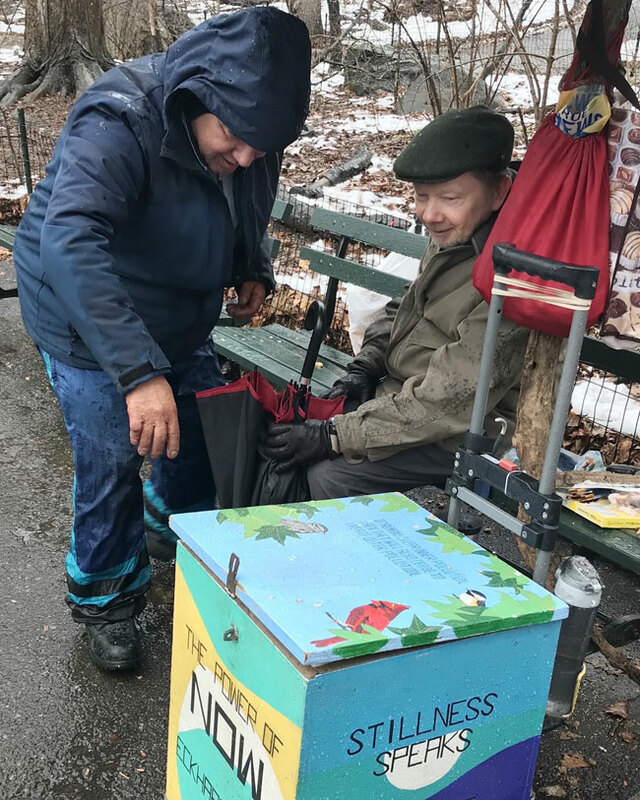 Rarely is one given the opportunity to witness such a sacred encounter as that of Armando and Eckhart Tolle meeting for the first time on a wet and chilly early April day in Central Park. I first met Armando on a summer day in 2013. I walked past a guy on a bench in Central Park who looked like your average homeless guy with a beard and a cart and then I saw the words on the cart. “Good grief, that doesn’t seem like your average homeless guy’s cart”! I thought. So I stopped and talked to him. I heard a little of his background, but there were so many people stopping to talk to him that there wasn’t much time to hear his story, a story that emerged over the many weeks and months I sat on that bench with Armando since then. Armando was born in Brooklyn on April 24, 1960, to Colombian and Puerto Rican parents. At some point that night, for the first time in his life, he had “a period of no suffering.” We might call it “a moment of grace.” He thinks it lasted about 20 minutes and it was the most amazing feeling of calm and peace he had ever felt. He waited for the night to end and in the morning he emerged from the pipe and dropped everything in the snow – the cigarettes, the crack pipe, the needle – and staggered to a bench. He found a homeless shelter that night and in the morning they noticed he was withdrawing and sent him to rehab. They said he had walked out of rehab twice from there already. He couldn’t remember, but there is a “3 strikes” rule so they let him stay and complete the physical detox. Clean and sober, he set out to discover what had happened to him. Many people tried to recruit him to their cause and he spent some time standing on a street corner talking about the Bible. But none of it felt right. About a year later, he was in the 96th Street library and he found a copy of The Power of Now by Eckhart Tolle, in Spanish. The way he describes it was that it was like coming home. Every word in that book resonated and he felt safe, comfortable and understood. Today, Armando sits on the same bench in Central Park every day. He feeds the birds, squirrels and dogs. Many a time I have come to visit him and found a privileged New Yorker crying about how sad they are and I see Armando quietly and calmly listening and accepting them. This man has more friends and has healed more lives simply by his presence than anyone I have ever met. I had a dream that one day Eckhart Tolle would walk down that path and shake Armando’s hand. Now we step back to hear the full chronology. At the request of Lorna Davis, Todd Schuster, who I believe is an agent in NYC, contacted Namaste Publishing’s agent Bill Gladstone saying he had a most wonderful story to tell that involved Eckhart Tolle and could he get it to Eckhart. Bill advised him he would have a better chance of getting something to Eckhart if it came through me, his publisher. As it happened, Eckhart was to be in NYC giving a talk on March 31st and then another talk to students of NYU the week of April 1st. “Oh, my God, it’s going to happen!” I said to myself. I quickly informed Lorna Davis who was elated as well. We all worked at keeping this a secret so as to surprise Armando when Eckhart walked to meet him on his bench. There were also several of us there to witness this sacred encounter. After a 20-minute walk from our entrance into the park, we approached Armando sitting on his bench. We watched from some distance as Eckhart walked up to Armando. When Eckhart reached him, Armando stood up and looked with shock and disbelief at first. Then the two men embraced. We stood there watching and there were tears while this tender, soulful hug continued for some time. Armando kept repeating that he couldn’t believe it, that he couldn’t take it all in immediately. His spiritual teacher was standing right in front of him and it wasn’t a vision. He kept repeating how breathless he was with surprise and gratitude. Soon, Armando put a small towel on his bench and invited Eckhart to sit. We stayed put while Eckhart and Armando conversed or maybe a more appropriate word is “communed.” When Eckhart pointed to us, it signalled Eckhart didn’t come alone and we were now invited to join them. I can only speak for myself, but I am confident that the five of us in attendance would say the same thing: our hearts were overflowing with love and gratitude as we witnessed this miracle in Central Park. Armando was animated, talkative and full of joy. He exuded warmth and love, with a heart so big and so wide open he could embrace all mankind. 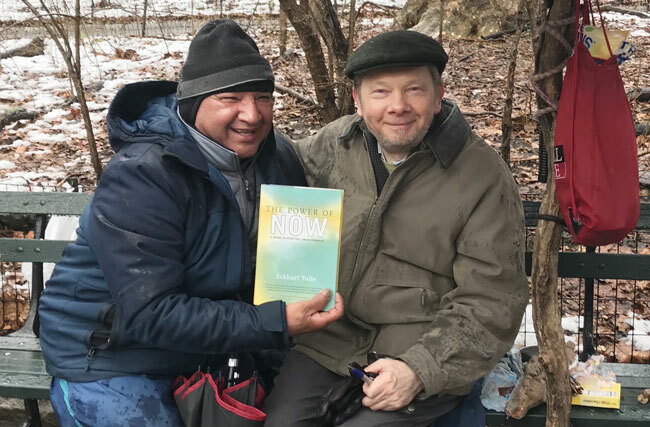 Eckhart Tolle, author of The Power of Now and A New Earth and one of the most renowned spiritual teachers in the world today, who has through his teachings elevated the consciousness of millions, met with Armando, surely worthy of being called his disciple. There are too few stories today that inspire us, that are heartwarming and that show us the power of loving connection and remind us of the goodness in mankind. Please feel free to share this “Good News” story with others.